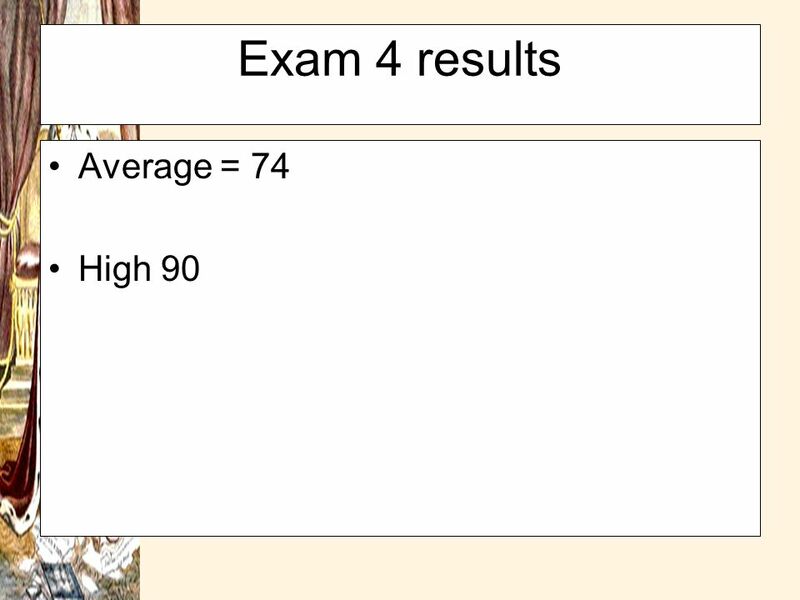 Exam 4 results Average = 74 High 90. 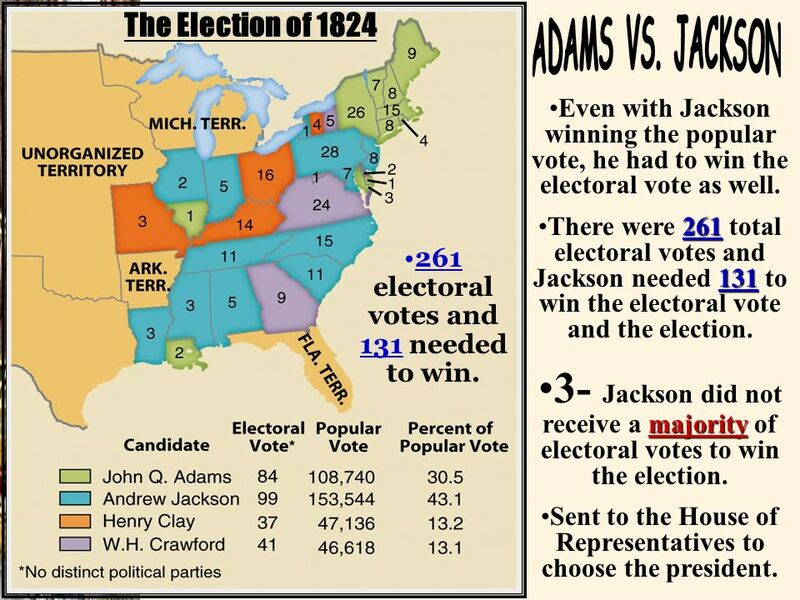 15 The Election of 1824 ADAMS VS. JACKSON Even with Jackson winning the popular vote, he had to win the electoral vote as well. 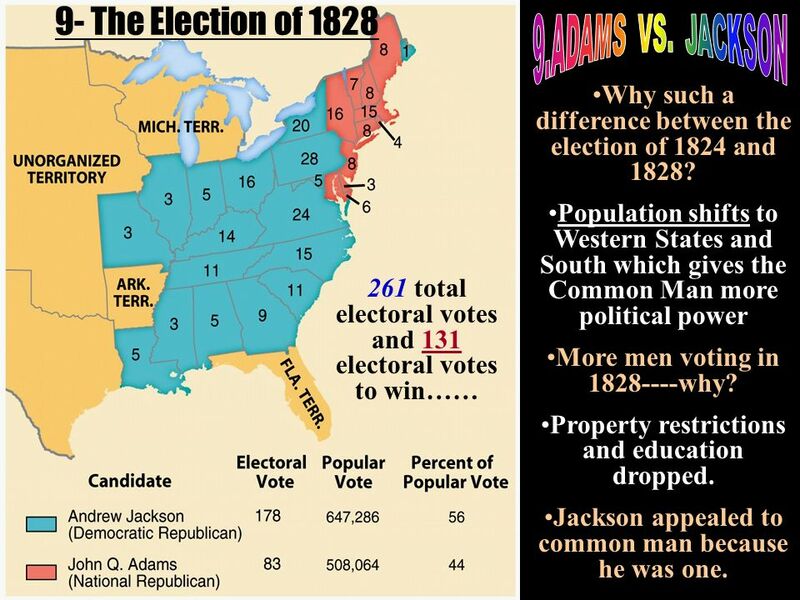 There were 261 total electoral votes and Jackson needed 131 to win the electoral vote and the election. 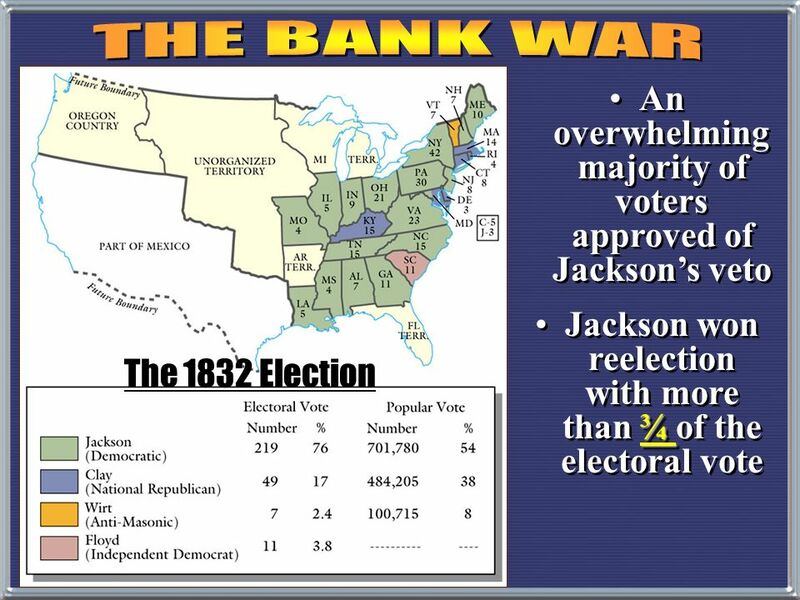 3- Jackson did not receive a majority of electoral votes to win the election. Sent to the House of Representatives to choose the president. 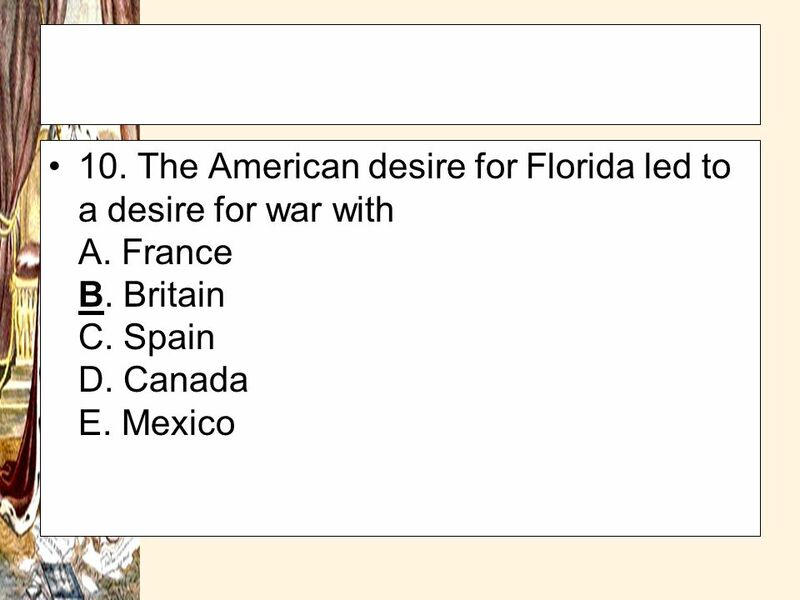 261 electoral votes and 131 needed to win. 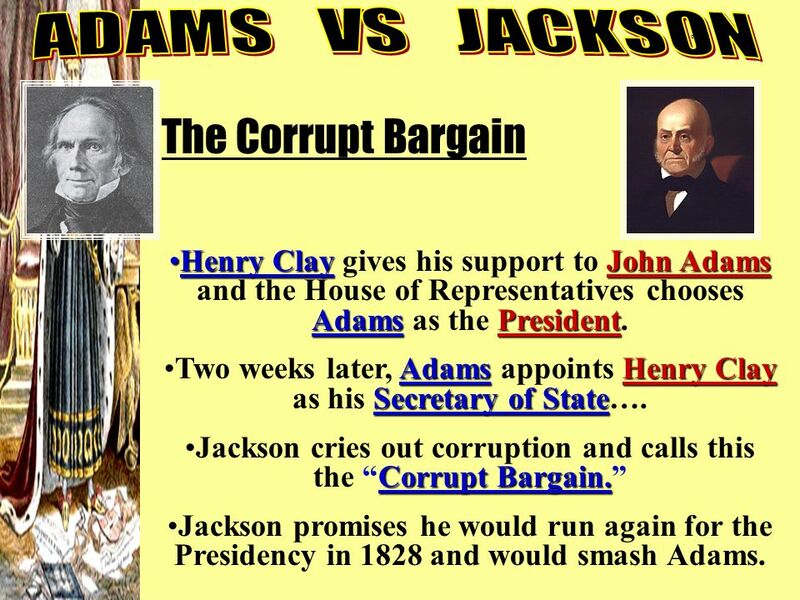 ADAMS VS JACKSON corrupt The Corrupt Bargain Henry Clay gives his support to John Adams and the House of Representatives chooses Adams as the President. 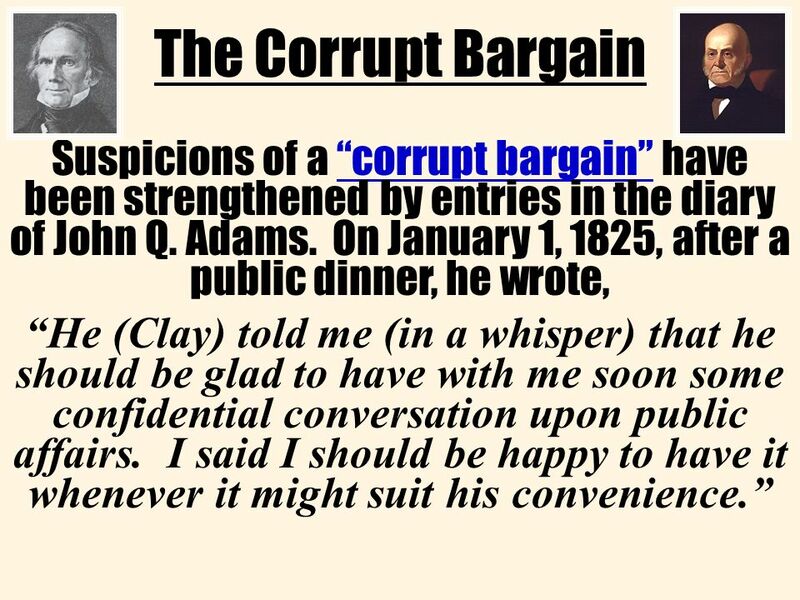 Two weeks later, Adams appoints Henry Clay as his Secretary of State…. 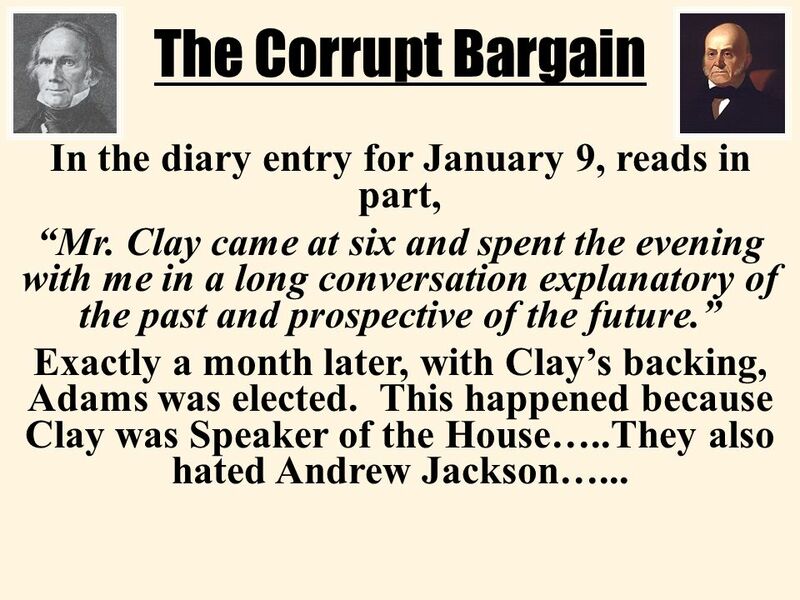 Jackson cries out corruption and calls this the “Corrupt Bargain.” Jackson promises he would run again for the Presidency in 1828 and would smash Adams. 19 5. 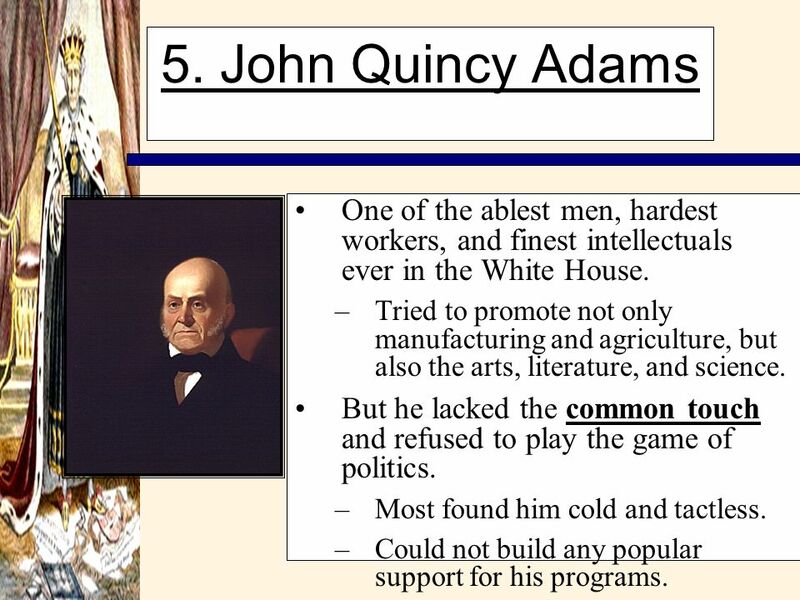 John Quincy Adams One of the ablest men, hardest workers, and finest intellectuals ever in the White House. Tried to promote not only manufacturing and agriculture, but also the arts, literature, and science. But he lacked the common touch and refused to play the game of politics. Most found him cold and tactless. Could not build any popular support for his programs. Not popular, failed to relate the common man. 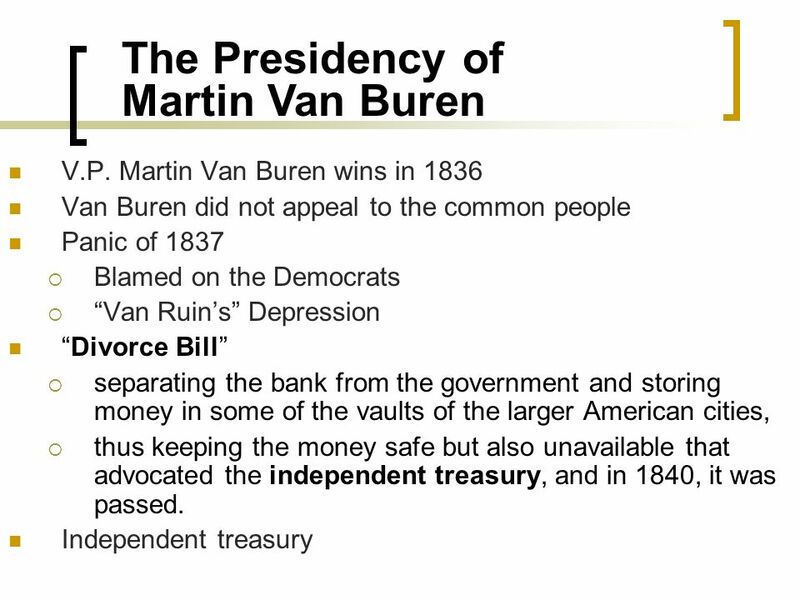 Supported protective tariff, BUS and internal improvements Minority president, last of the Federalists and connection with the Founding Fathers…. 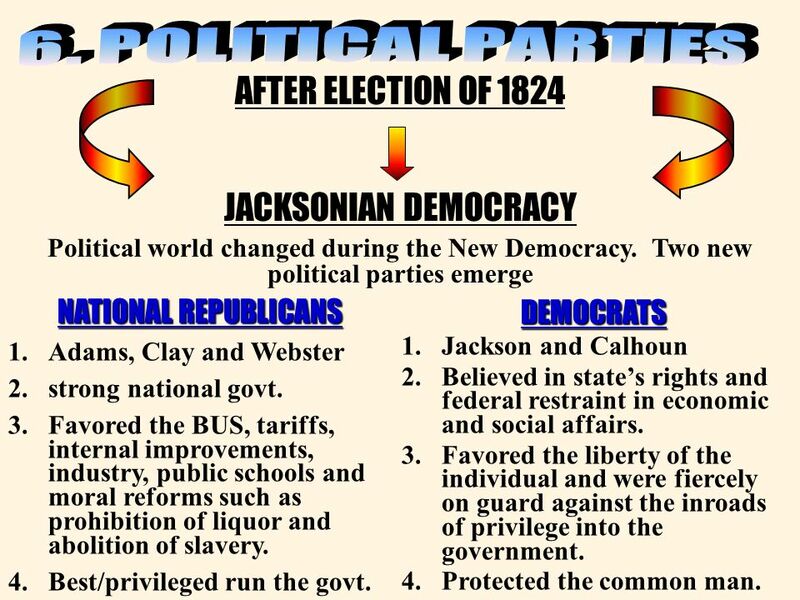 JACKSONIAN DEMOCRACY Political world changed during the New Democracy. 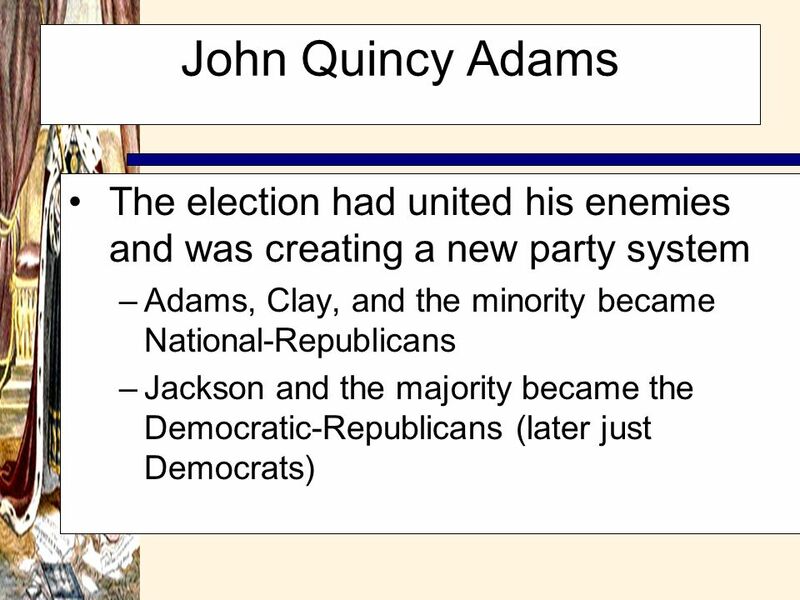 Two new political parties emerge NATIONAL REPUBLICANS Adams, Clay and Webster strong national govt. 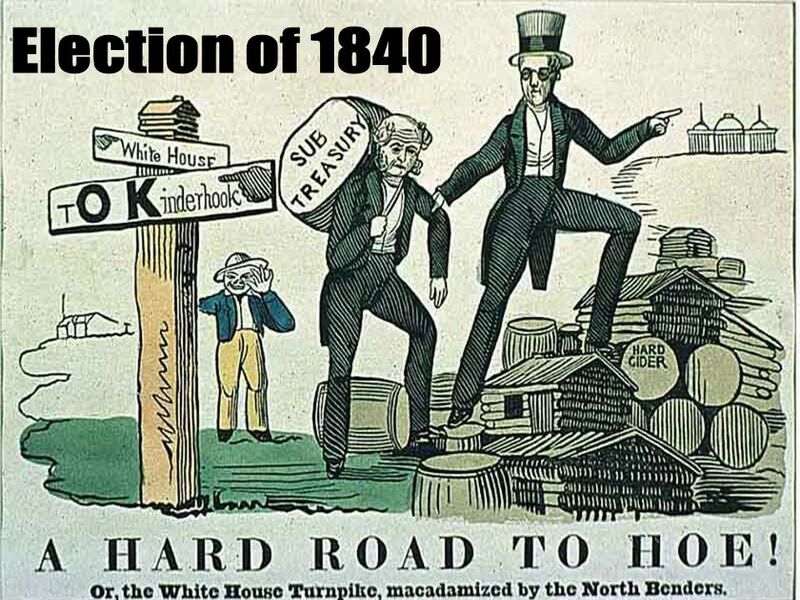 Favored the BUS, tariffs, internal improvements, industry, public schools and moral reforms such as prohibition of liquor and abolition of slavery. Best/privileged run the govt. 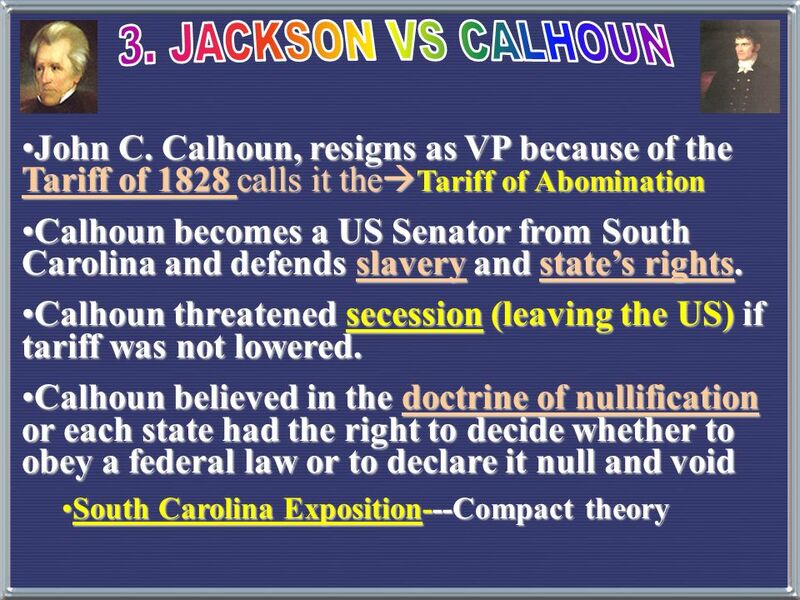 DEMOCRATS Jackson and Calhoun Believed in state’s rights and federal restraint in economic and social affairs. 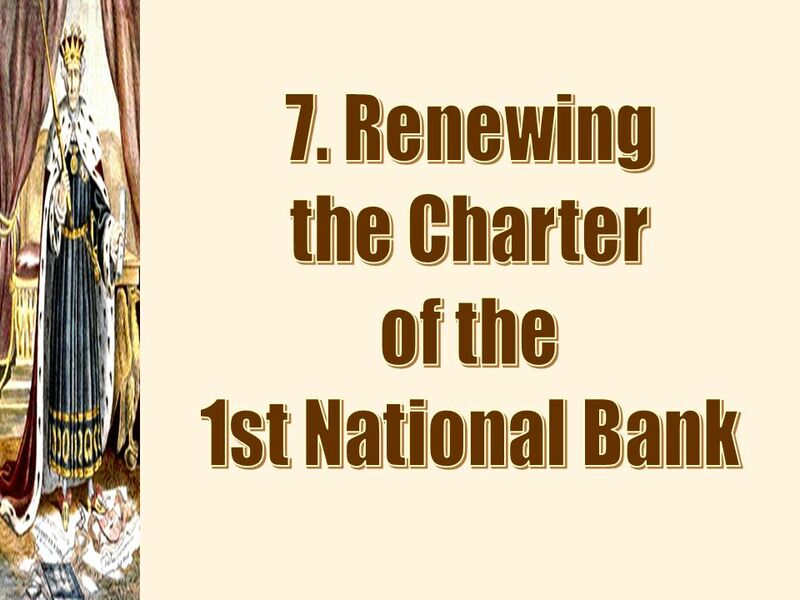 Favored the liberty of the individual and were fiercely on guard against the inroads of privilege into the government. Protected the common man. 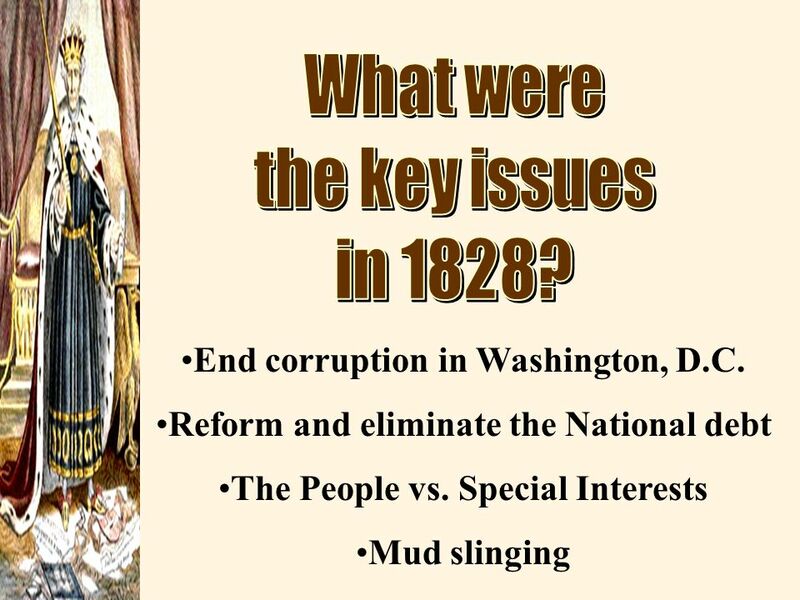 23 End corruption in Washington, D.C.
Election of 1828 Election of 1828 An American Tragedy Jackson and J. Q. Adams ran against each other for the presidency One anti-Jackson newspaper declared, “General Jackson’s mother was a common prostitute, brought to this country by the British soldiers! 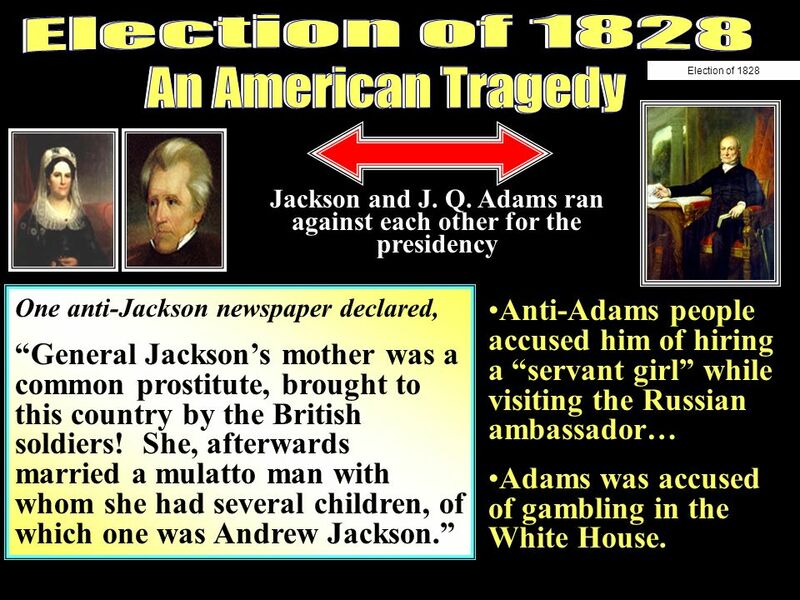 She, afterwards married a mulatto man with whom she had several children, of which one was Andrew Jackson.” Anti-Adams people accused him of hiring a “servant girl” while visiting the Russian ambassador… Adams was accused of gambling in the White House. 8. 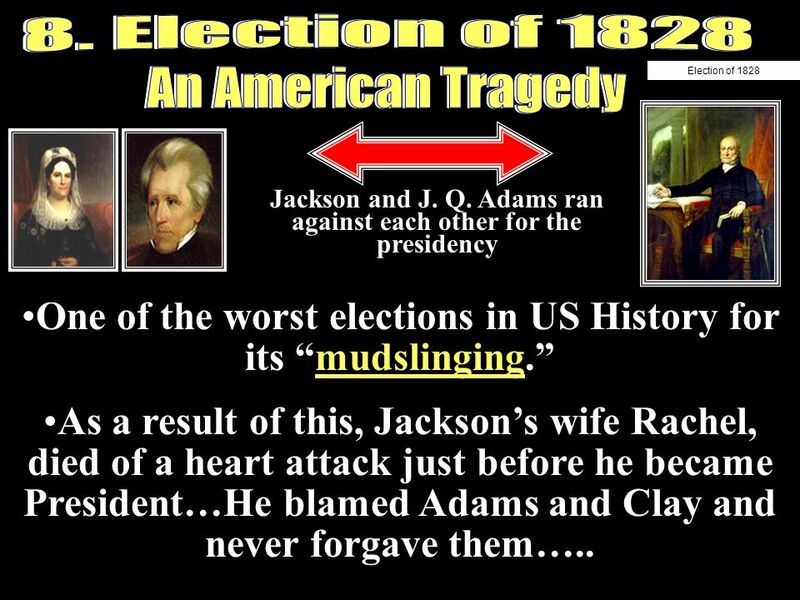 Election of 1828 Election of 1828 An American Tragedy Jackson and J. Q. Adams ran against each other for the presidency One of the worst elections in US History for its “mudslinging.” As a result of this, Jackson’s wife Rachel, died of a heart attack just before he became President…He blamed Adams and Clay and never forgave them…..
27 Tomb of Jackson and his wife. 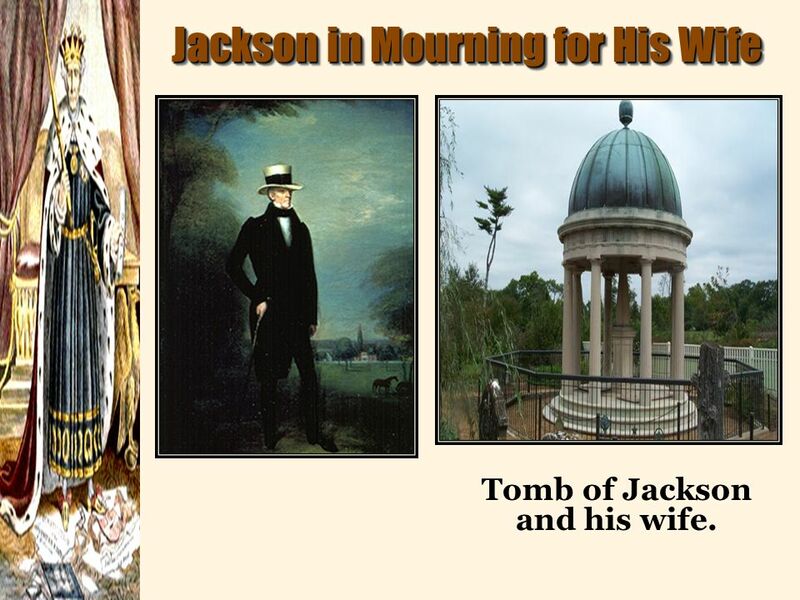 Jackson in Mourning for His Wife Tomb of Jackson and his wife. 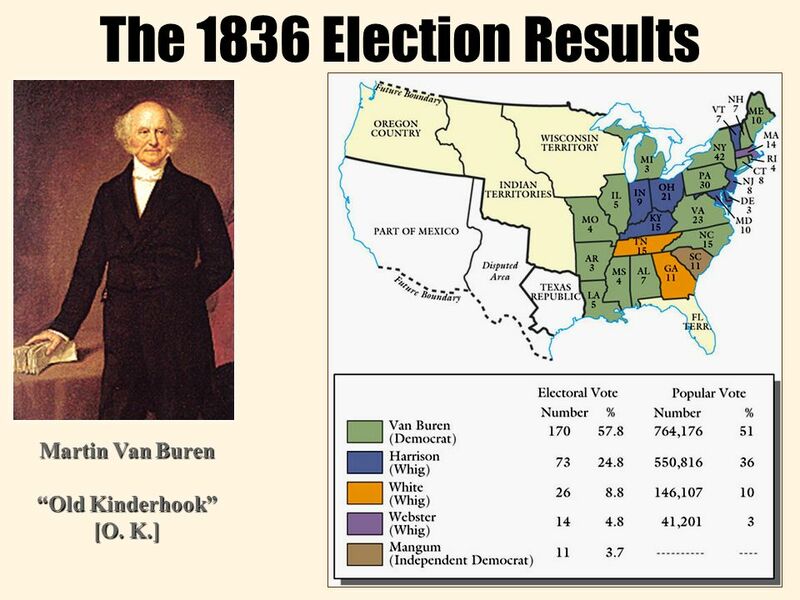 Election of 1824, 355,817 voted. 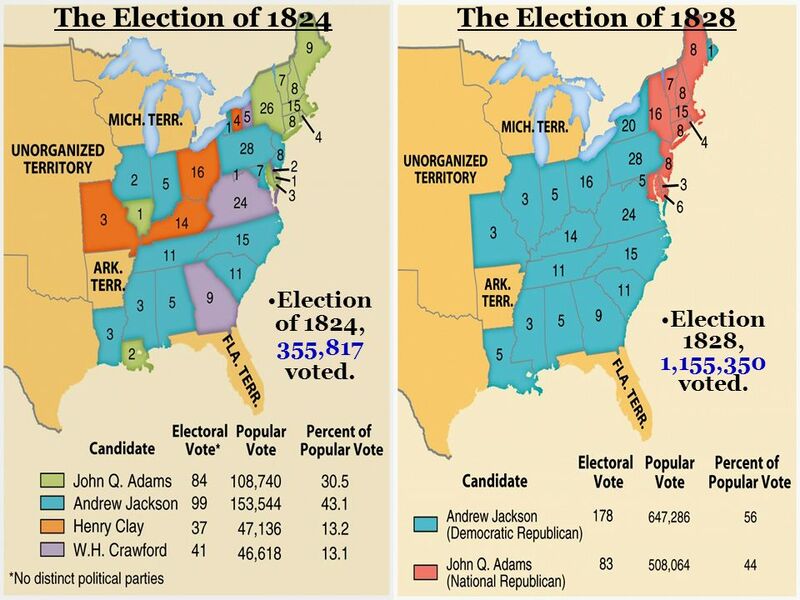 Election 1828, 1,155,350 voted. 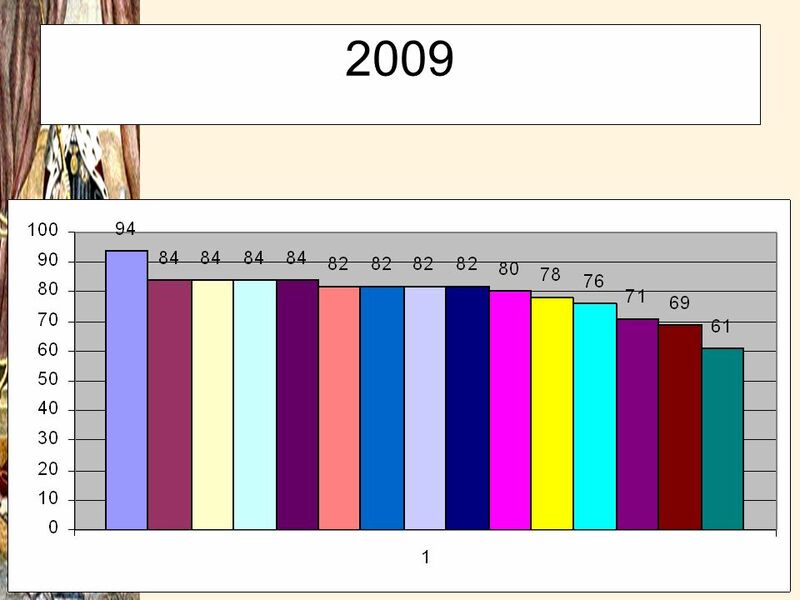 30 1790 WMA 21 yrs. old, educated and property owner……. 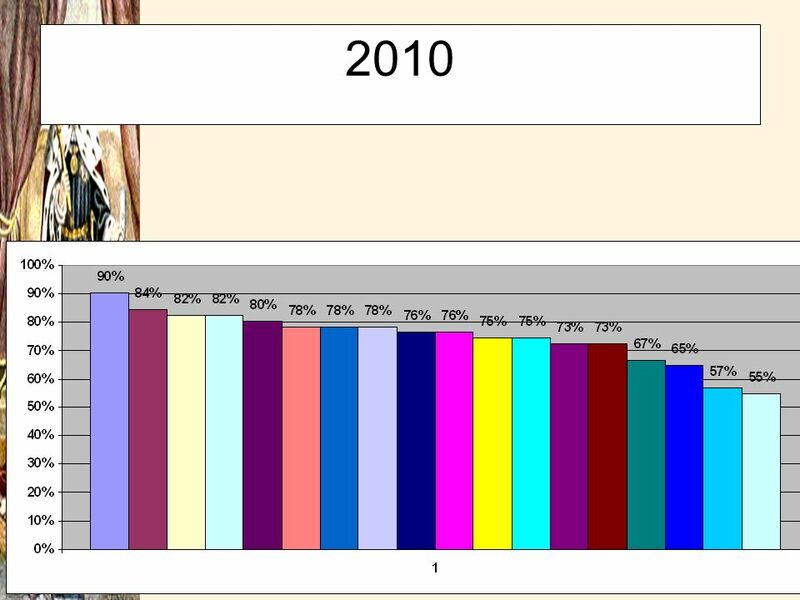 voting WMA 21 yrs. old, educated and property owner……. 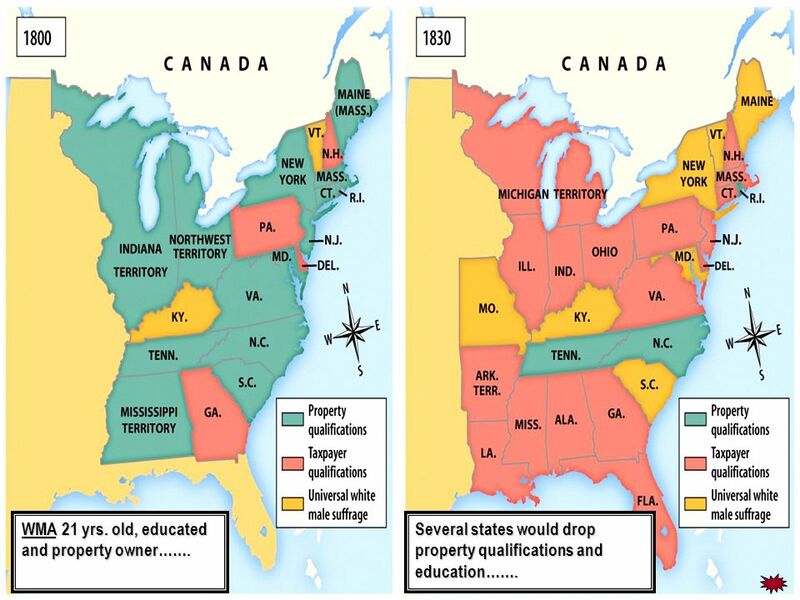 Several states would drop property qualifications and education……. 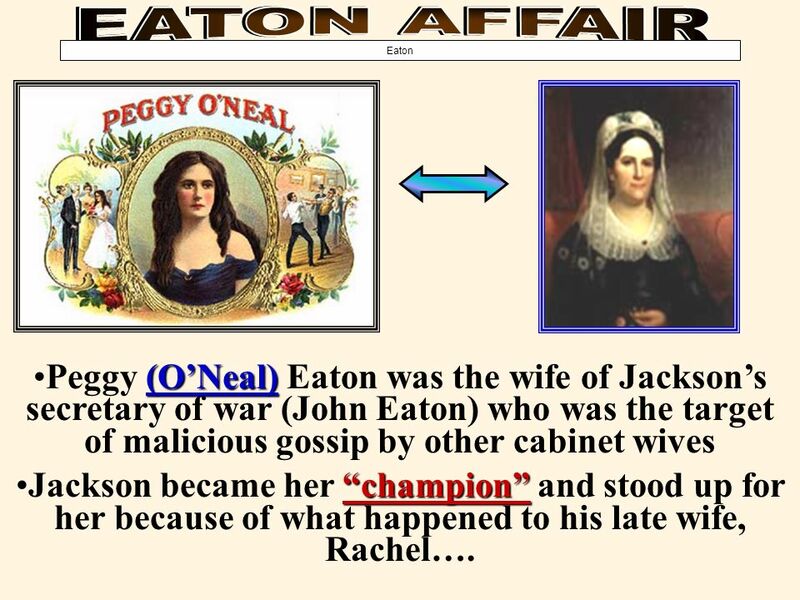 34 EATON AFFAIR Eaton Peggy (O’Neal) Eaton was the wife of Jackson’s secretary of war (John Eaton) who was the target of malicious gossip by other cabinet wives Jackson became her “champion” and stood up for her because of what happened to his late wife, Rachel…. 35 VP Calhoun resigns and goes back to South Carolina. 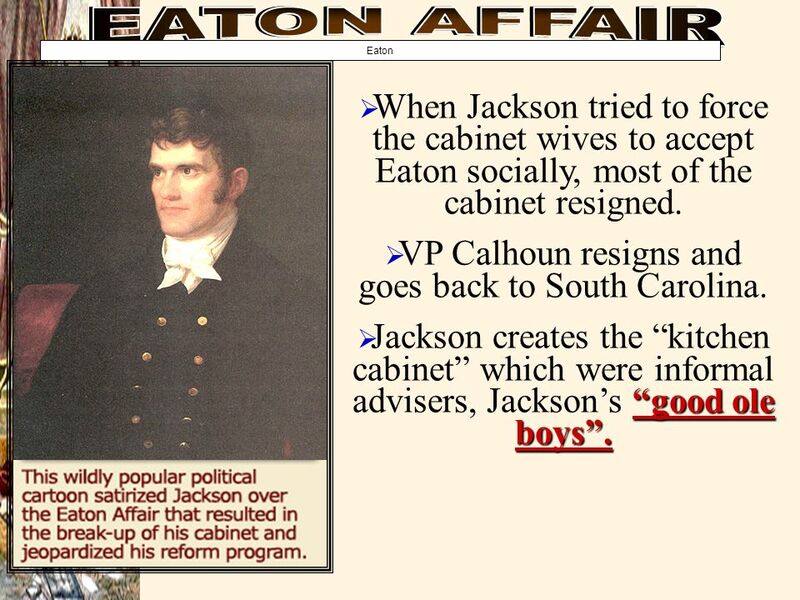 EATON AFFAIR Eaton When Jackson tried to force the cabinet wives to accept Eaton socially, most of the cabinet resigned. VP Calhoun resigns and goes back to South Carolina. 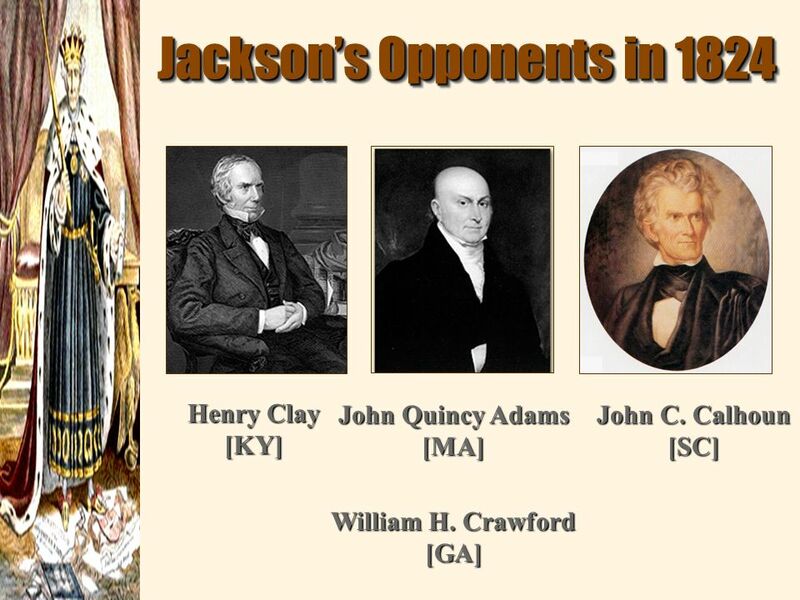 Jackson creates the “kitchen cabinet” which were informal advisers, Jackson’s “good ole boys”. 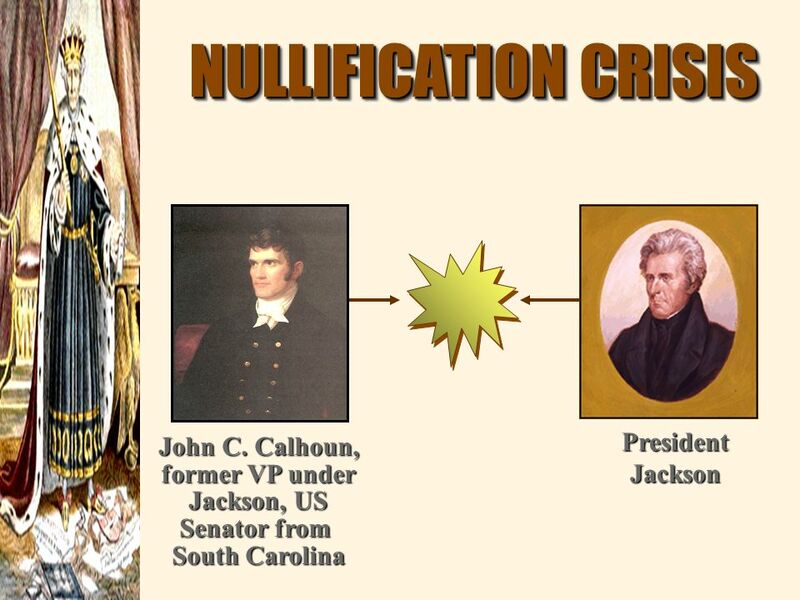 JACKSON VS CALHOUN The Nullification Crisis 6. 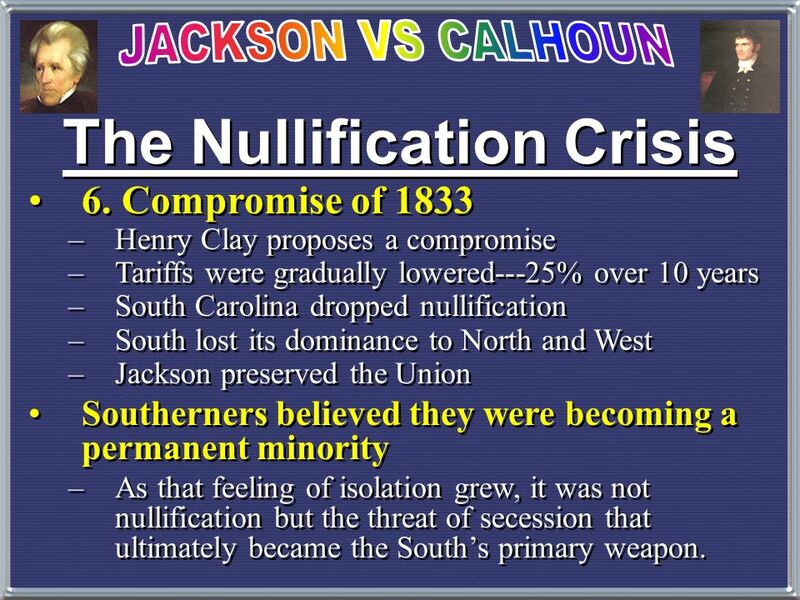 Compromise of 1833 Henry Clay proposes a compromise Tariffs were gradually lowered---25% over 10 years South Carolina dropped nullification South lost its dominance to North and West Jackson preserved the Union Southerners believed they were becoming a permanent minority As that feeling of isolation grew, it was not nullification but the threat of secession that ultimately became the South’s primary weapon. 46 Jackson believed BUS was too powerful because it was privately owned. 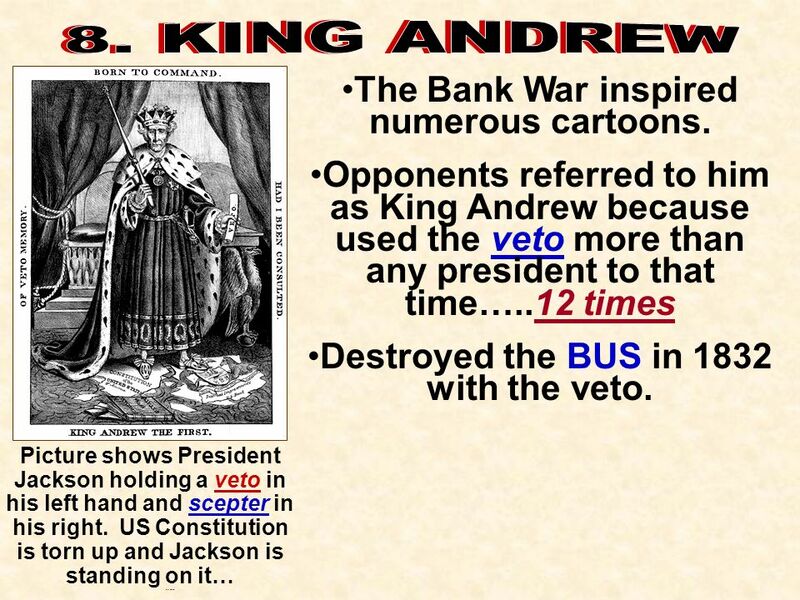 48 Destroyed the BUS in 1832 with the veto. 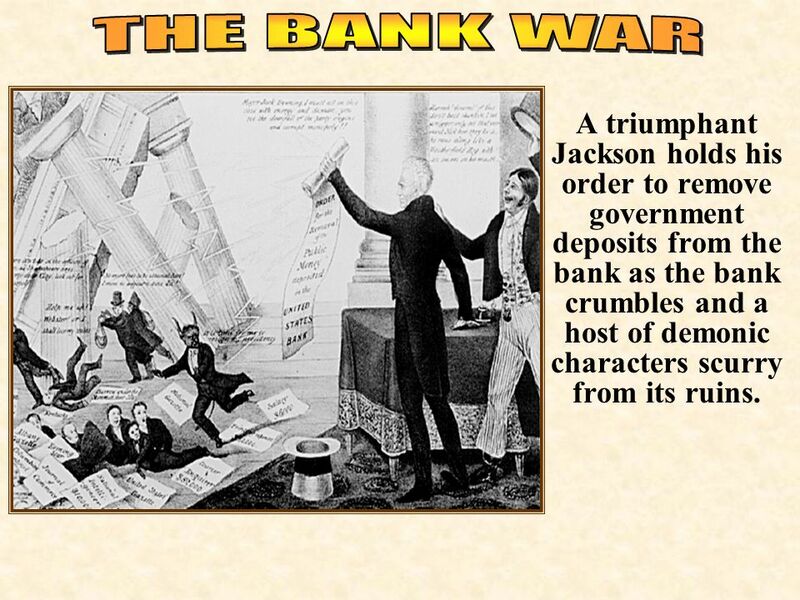 50 THE BANK WAR A triumphant Jackson holds his order to remove government deposits from the bank as the bank crumbles and a host of demonic characters scurry from its ruins. 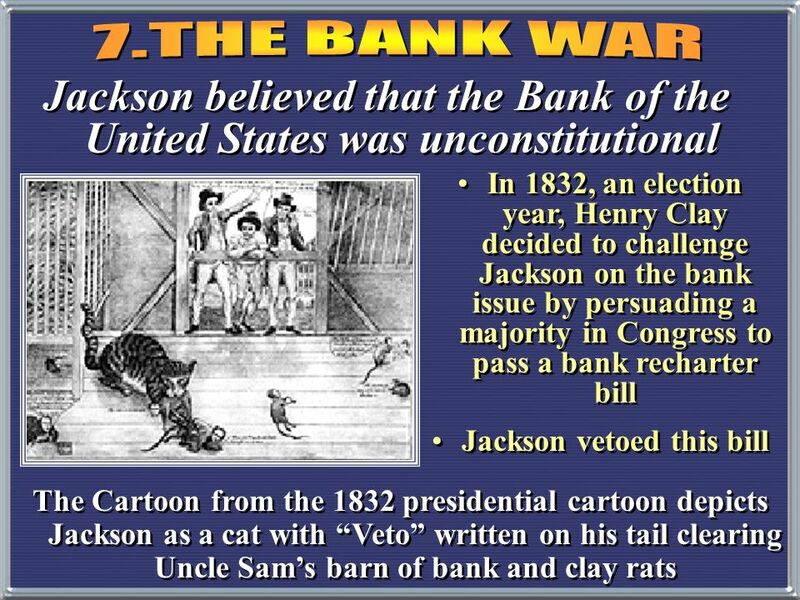 The Bank War inspired numerous cartoons. 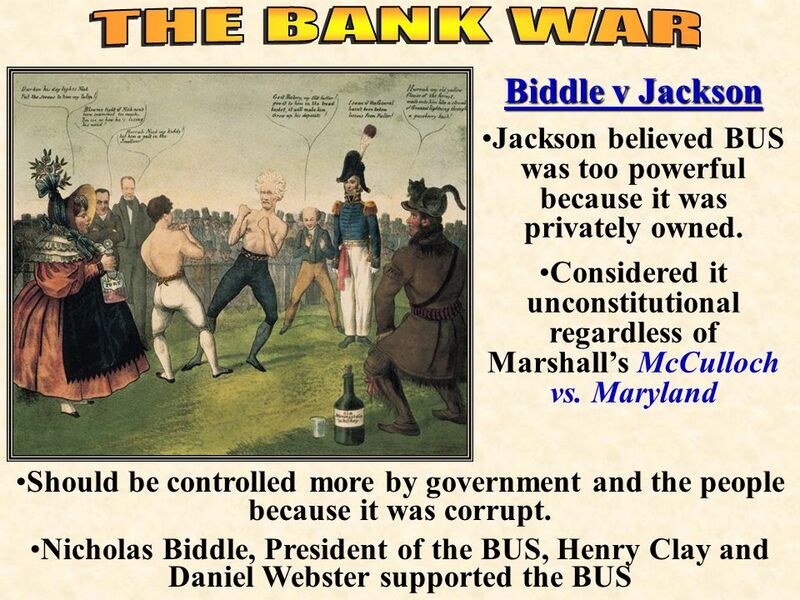 The boxers are Nicholas Biddle and Andrew Jackson. The lady holding a bottle of port says, "Darken his daylights, Nick. Put the Screws to him my tulip!" 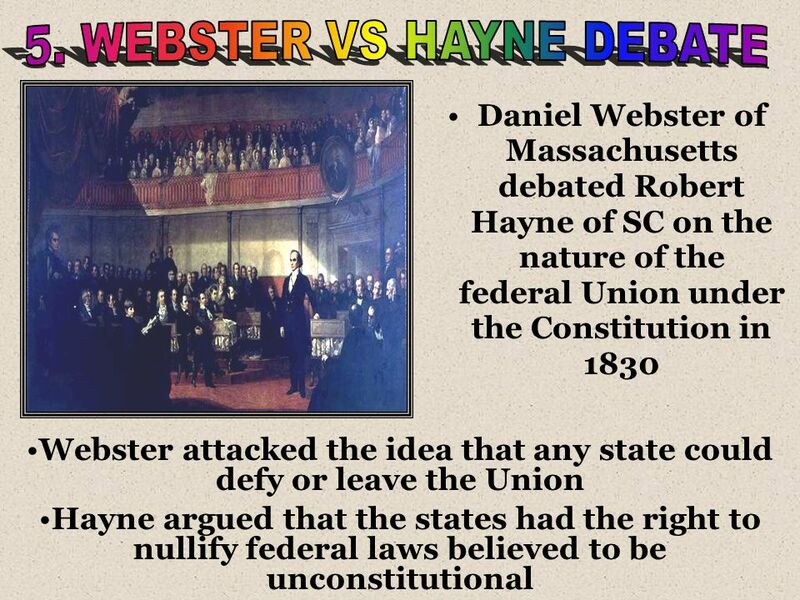 Daniel Webster: "Blow me tight if Nick ain't been crammed too much. You see as how he's losing his wind!" 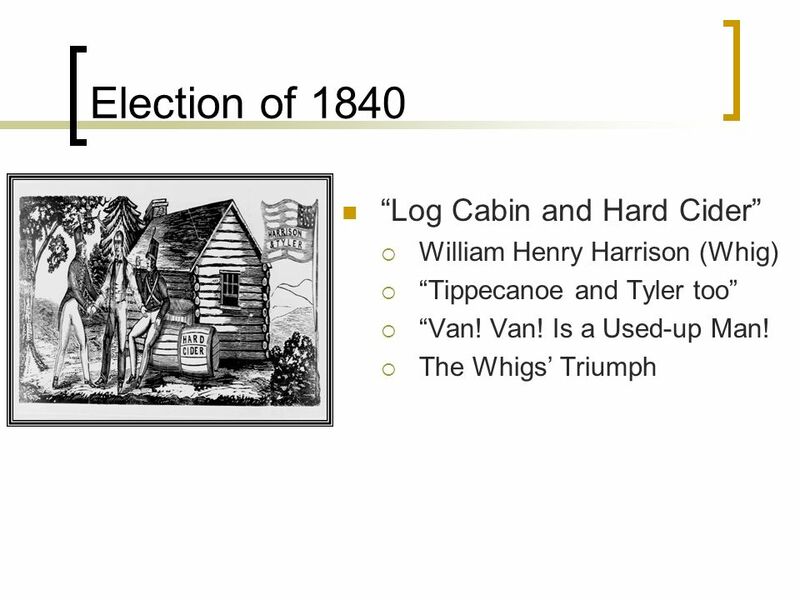 Henry Clay: "Hurrah Nick my kiddy! Hit him a pelt in the smellers!" 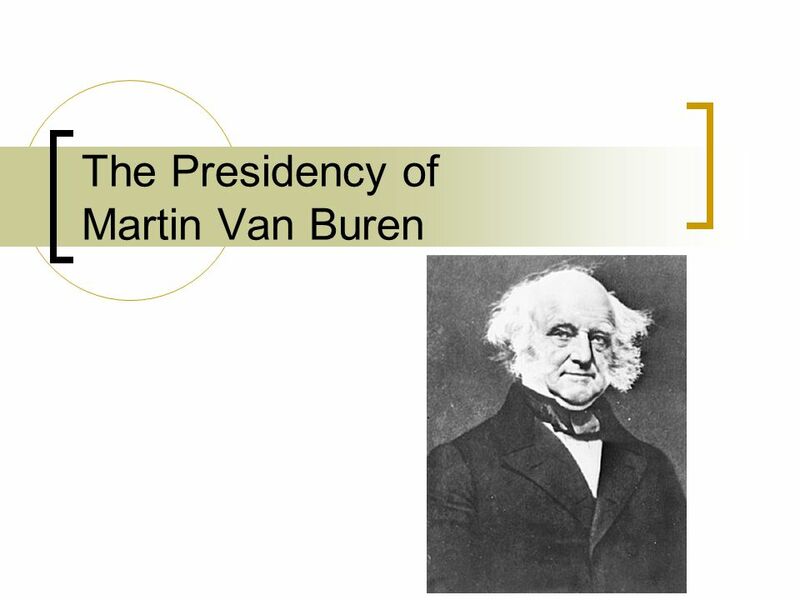 Martin Van Buren: "Go it Hickory, my old Duffer! give it to him in the bread basket, it will make him throw up his deposits!" 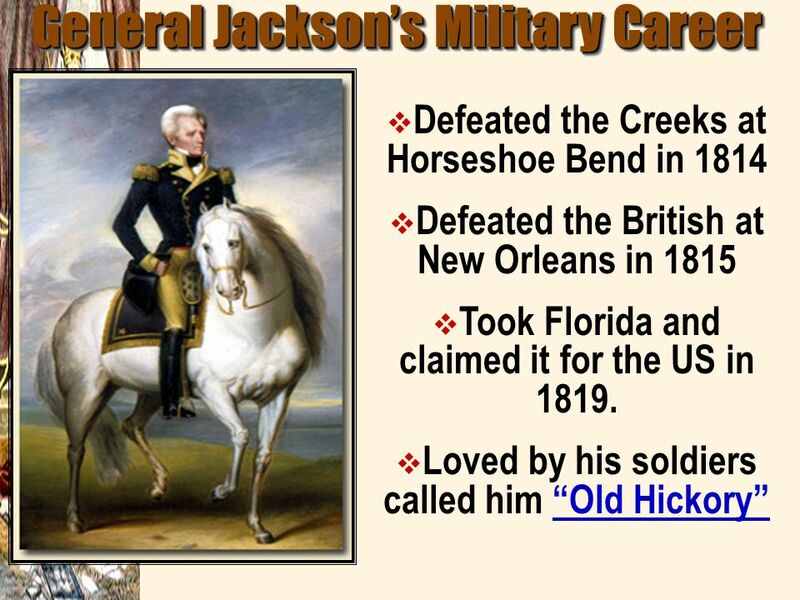 Major Jack Downing (a mythical Jacksonian hero): "I swan if the Ginral hain't been taken lessons from Fuller!" The man standing next to the whiskey bottle: "Hurrah my old yallow flower of the forrest, walk into him like a streak of Greased lightning through a gooseberry bush!" 51 9. 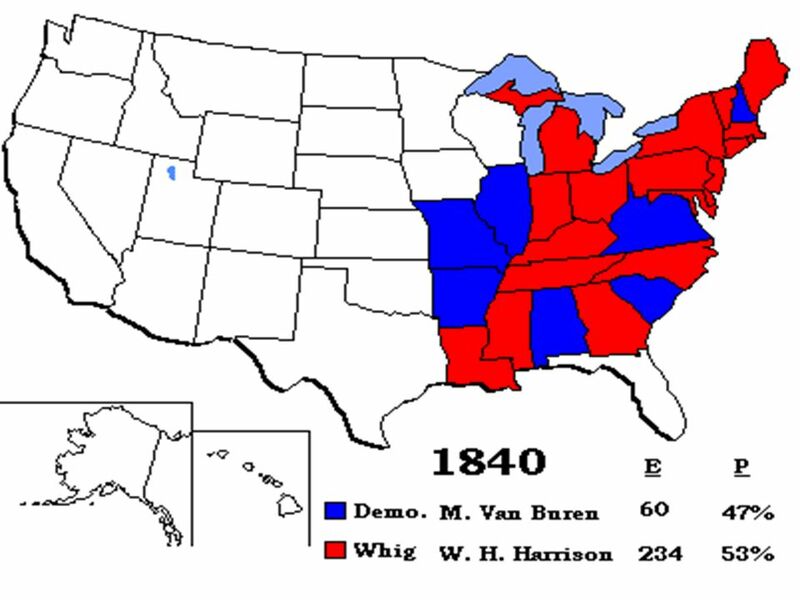 2 groups Opposed to the 2nd B.U.S. 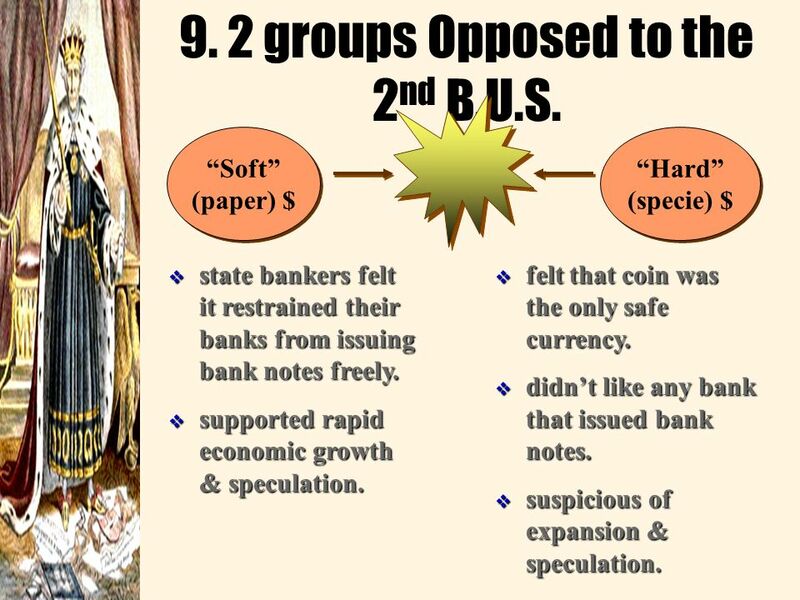 “Soft” (paper) $ “Hard” (specie) $ state bankers felt it restrained their banks from issuing bank notes freely. supported rapid economic growth & speculation. felt that coin was the only safe currency. didn’t like any bank that issued bank notes. suspicious of expansion & speculation. 52 10. The “Monster” Is Destroyed! 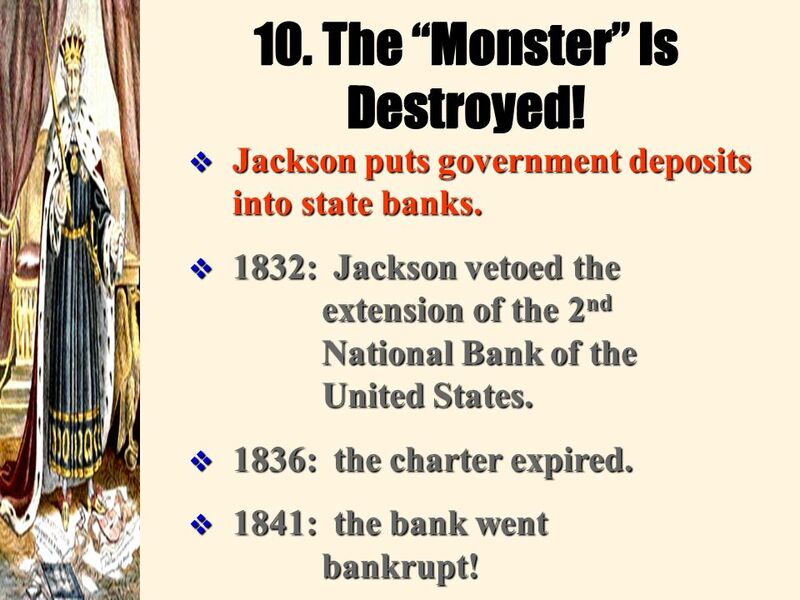 Jackson puts government deposits into state banks. 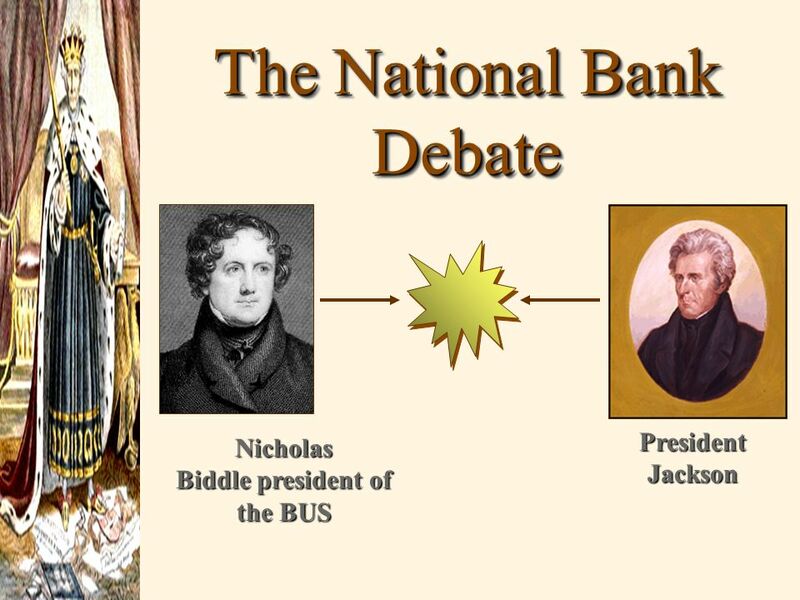 1832: Jackson vetoed the extension of the 2nd National Bank of the United States. 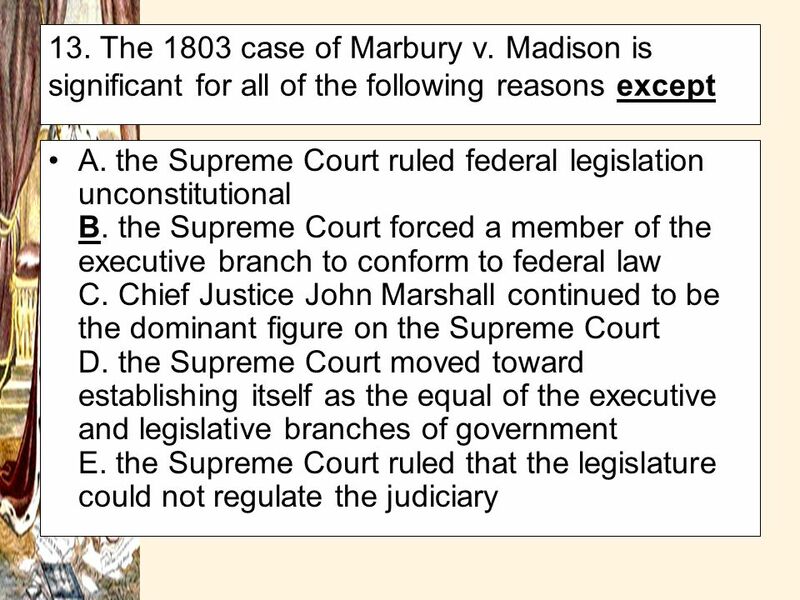 1836: the charter expired. 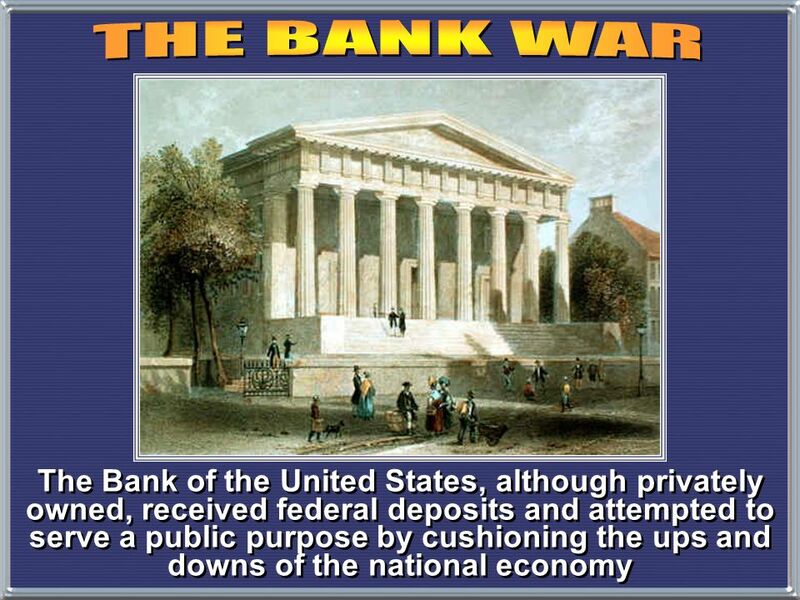 1841: the bank went bankrupt! 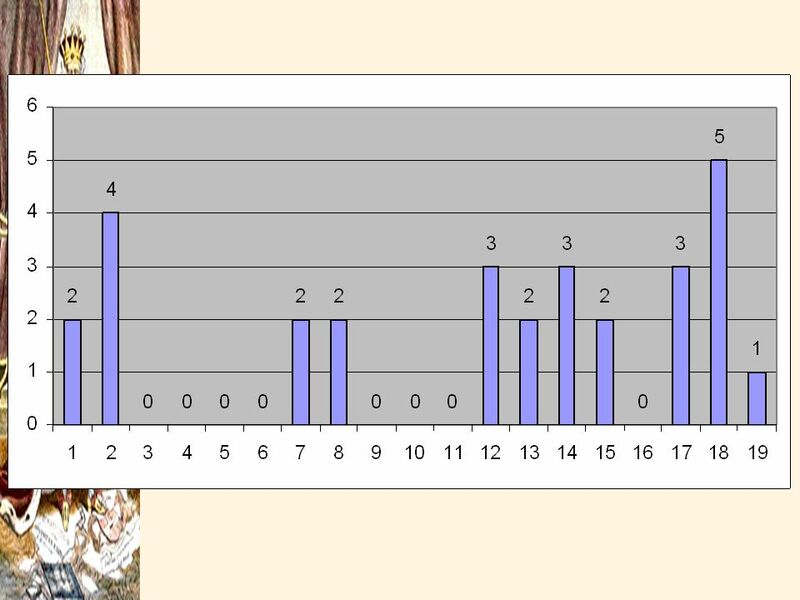 Download ppt "Exam 4 results Average = 74 High 90." Warm-Up 5.1 Know Want to Know Learned. As soon as you sit down: Open your textbook to page 348 and read section 3. Even if you have already read it, read it again. 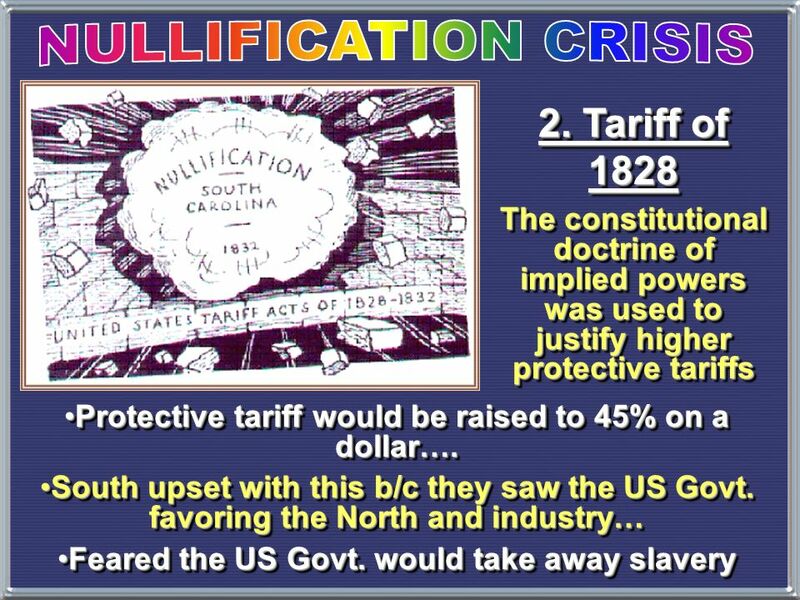 Goal 2 Part 3 Nullification Crisis and Jacksonian Democracy. 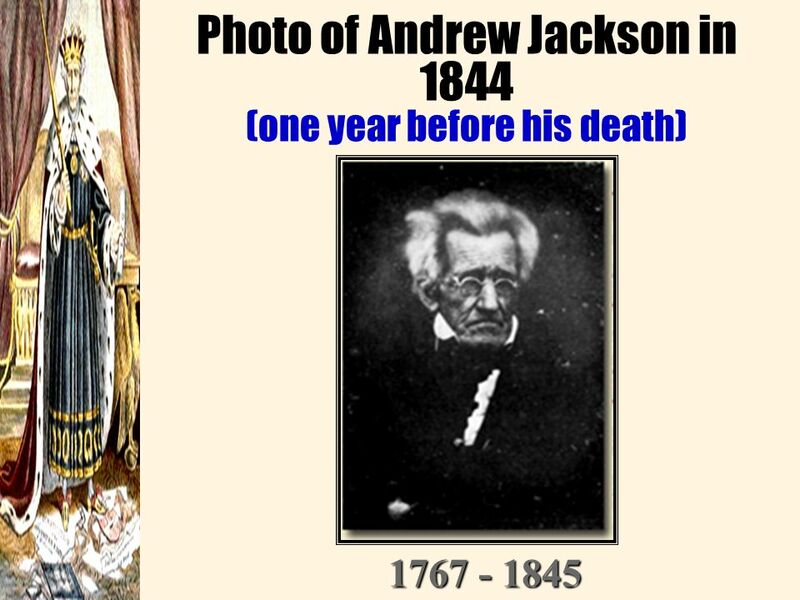 The Age of Jackson Andrew Jackson’s policies speak for common people but violate Native American rights. NEXT. 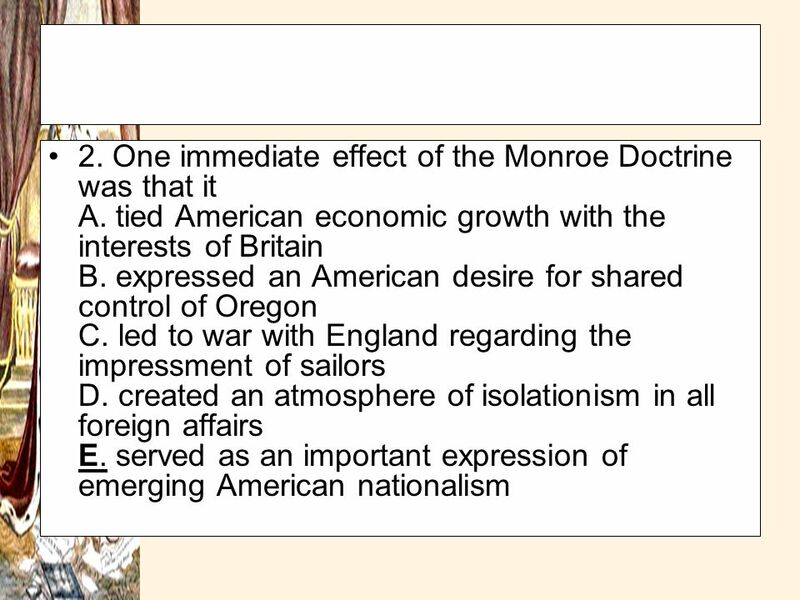 UNIT 3 NOTES. 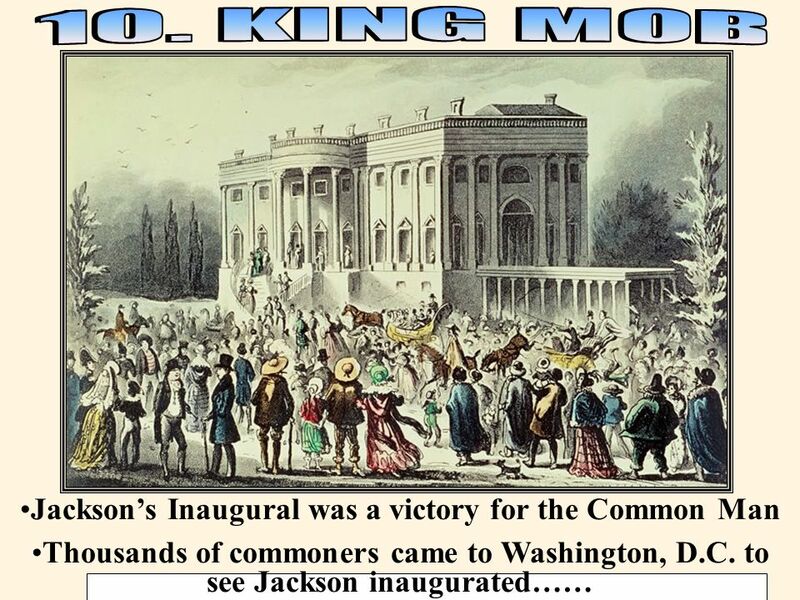 Essential Question Champion of the Common Man? 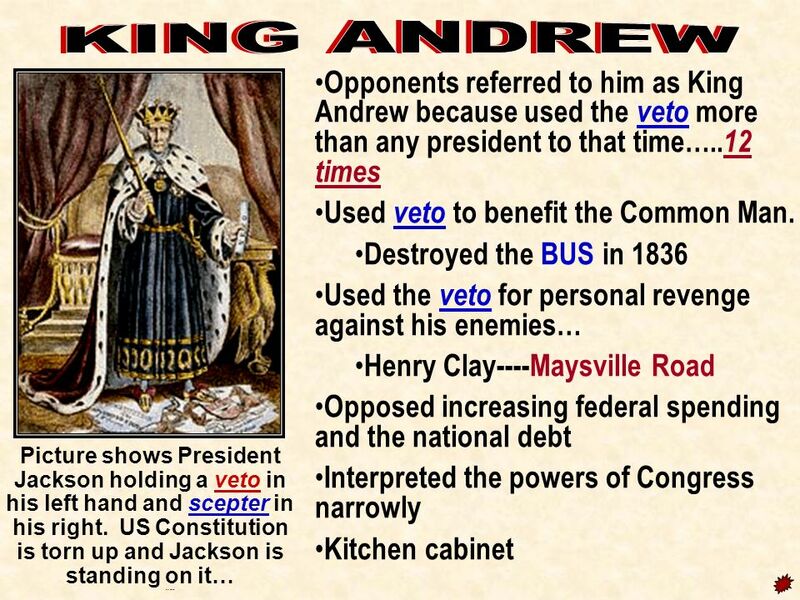 King Andrew? OR. 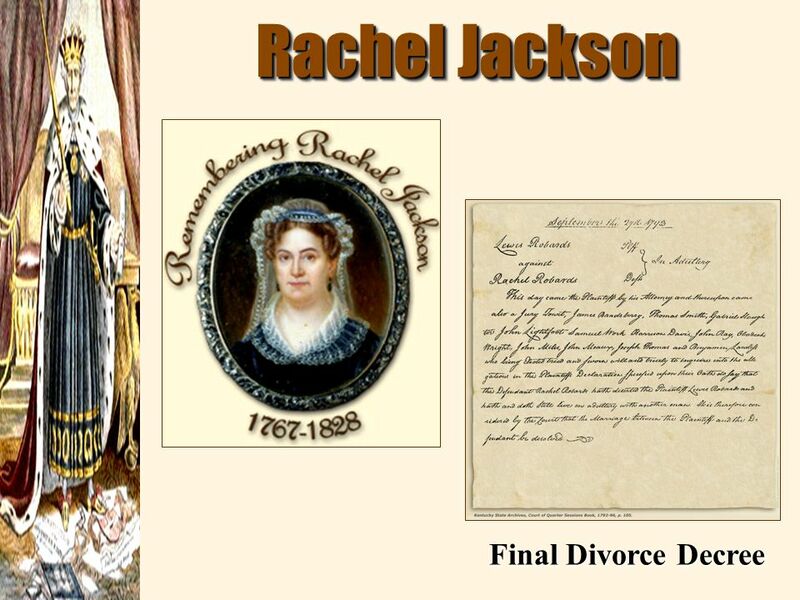 The Age of Jackson Section 3 Chapter 11. 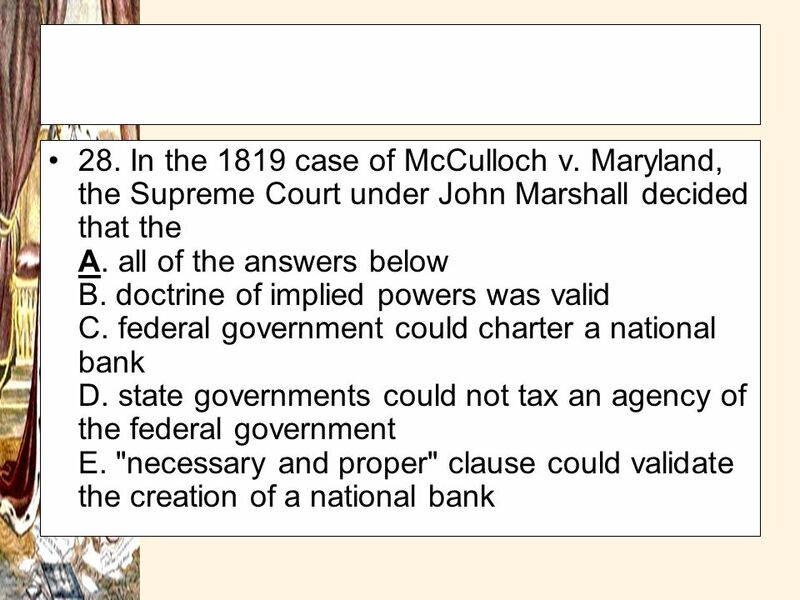 States’ Rights & the Bank of the US. 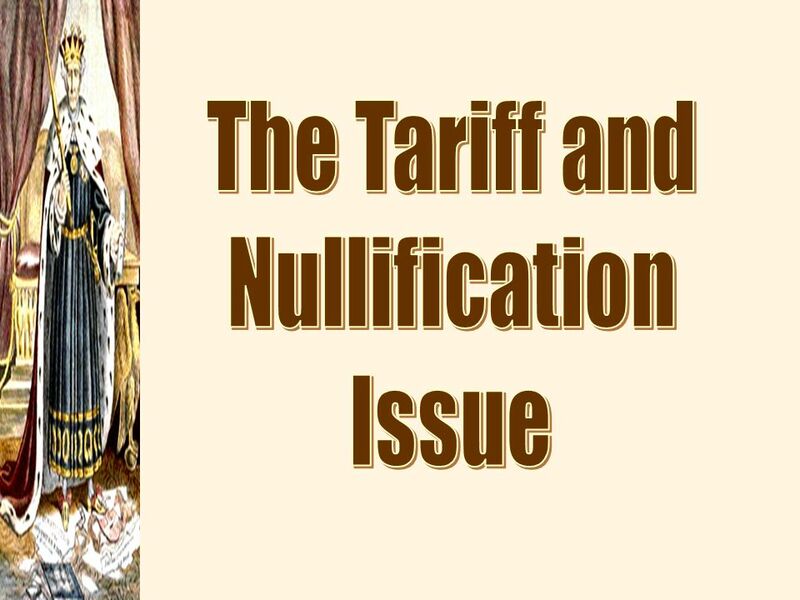 The South & the Tariff After War of 1812: –Protective tariff established –Benefitted businesses in north trying to. 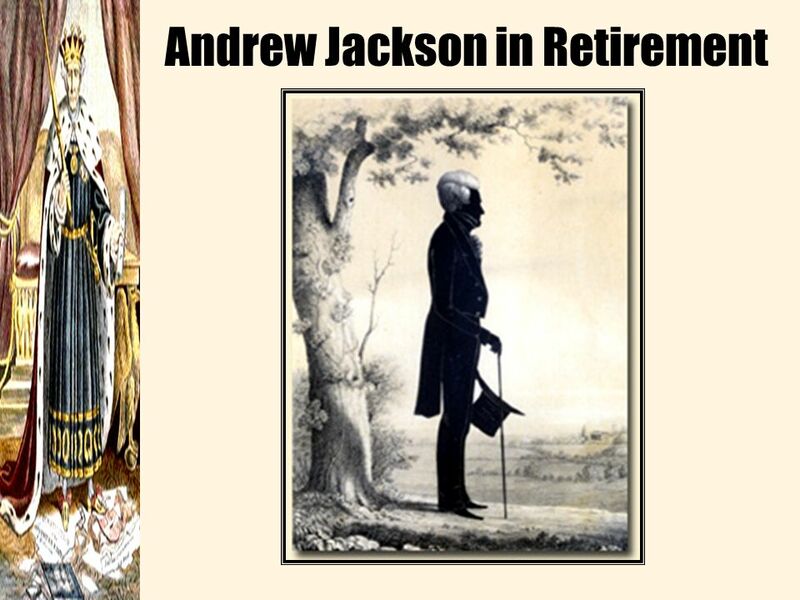 Essential Question What were the important events of Andrew Jackson’s presidency? 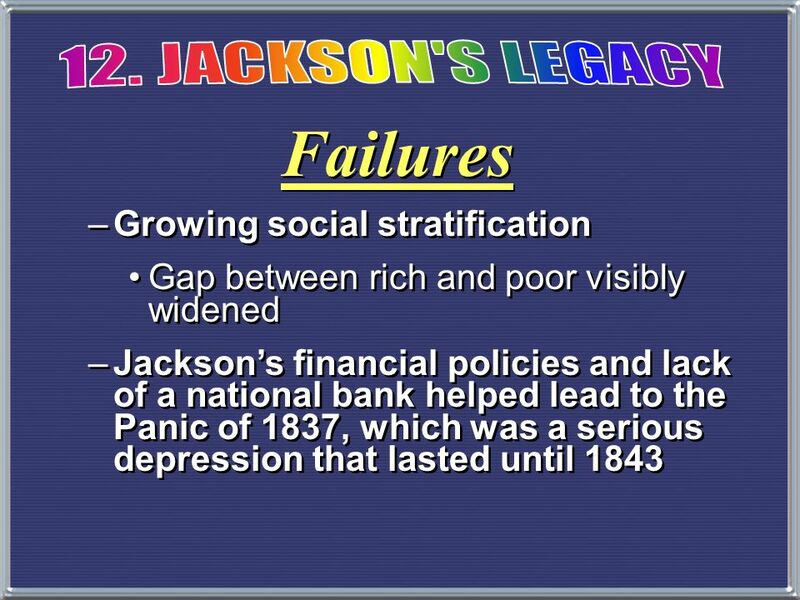 The Jackson Era Chapter 11 Review. 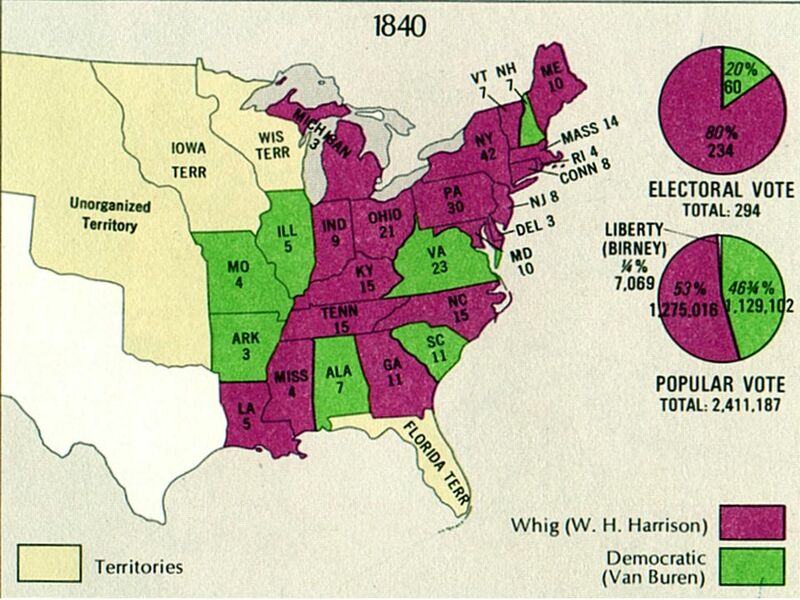 Who were the four candidates who ran for President in 1824? Where were they from? 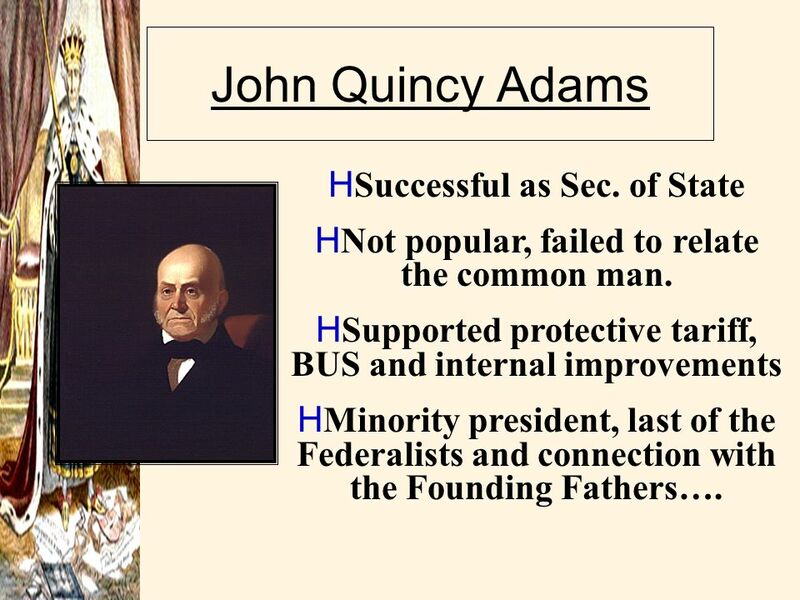 John Quincy Adams, New England Henry. ADAMS, JACKSON, AND VAN BUREN. 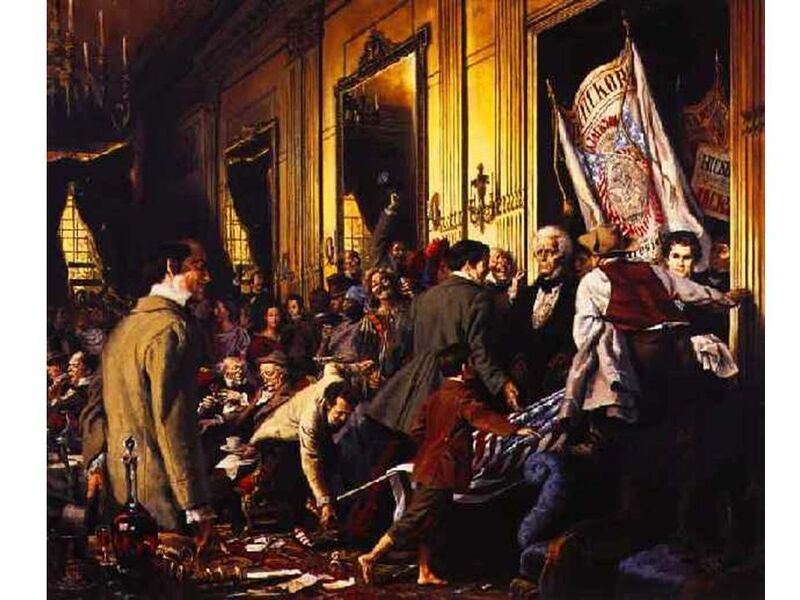 THE ELECTION OF 1824. 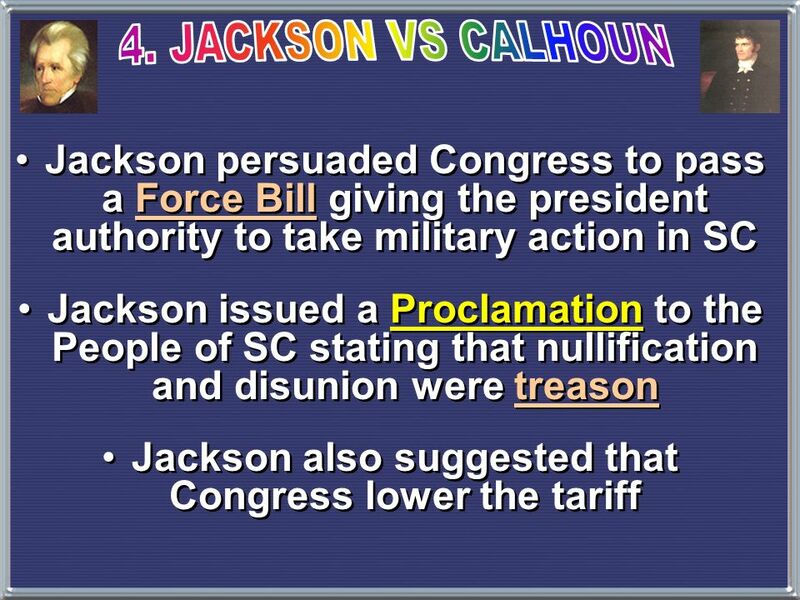 Andrew Jackson’s Presidency Unit 5, Lesson 1. 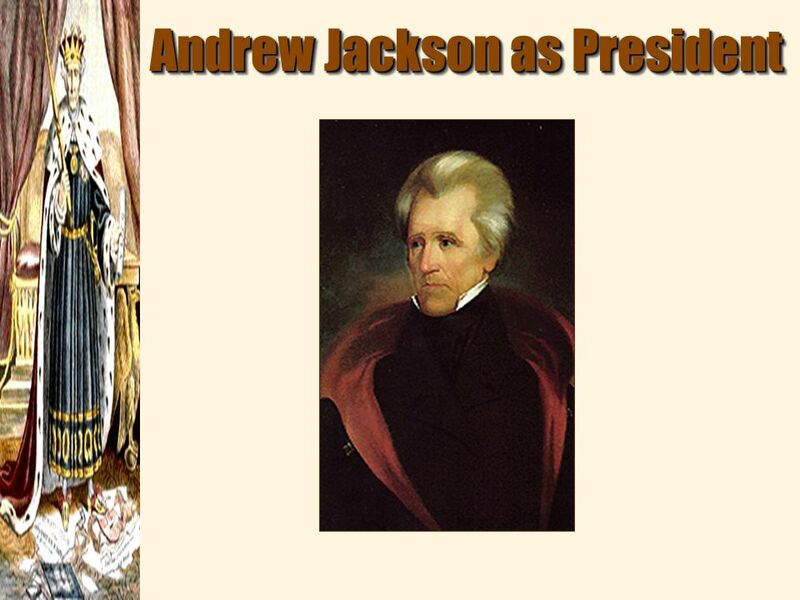 Essential Idea Andrew Jackson’s presidency involved “new” democracy, the Nullification Crisis, the Indian. 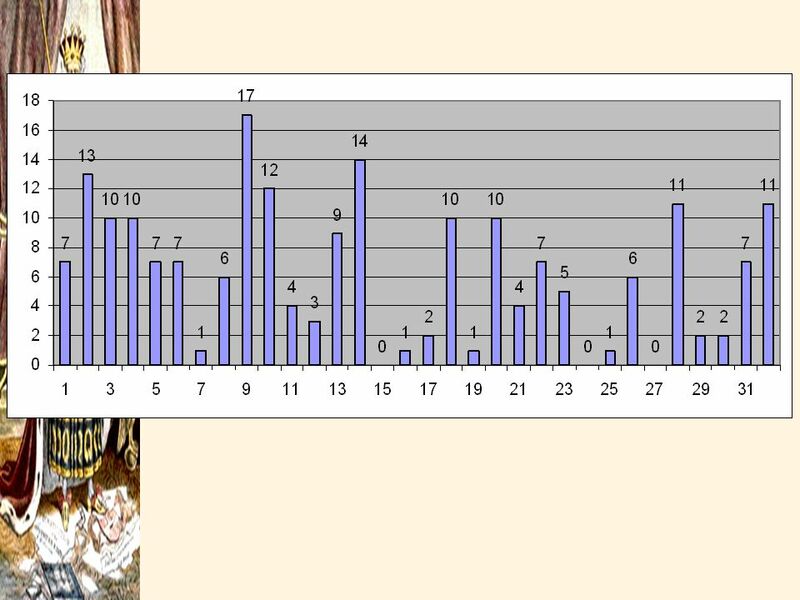 Chapter 11 Sec. 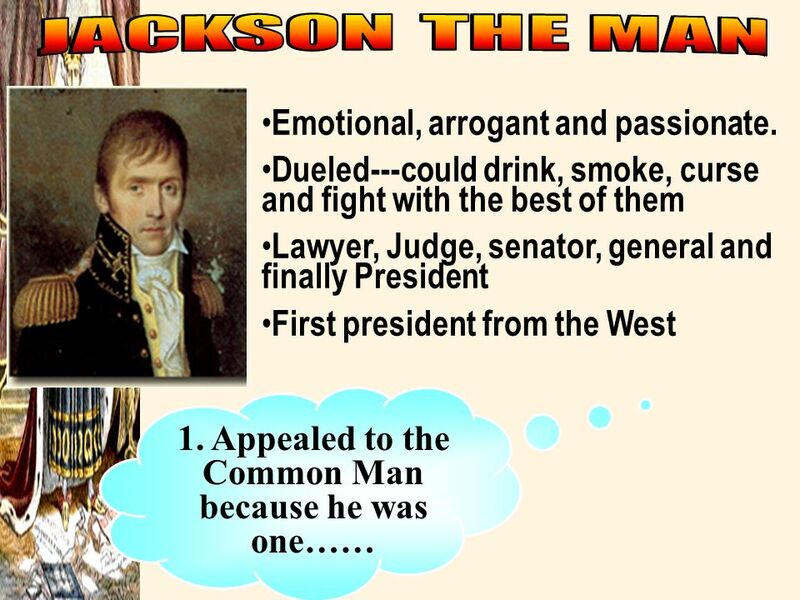 1 Jackson Era. 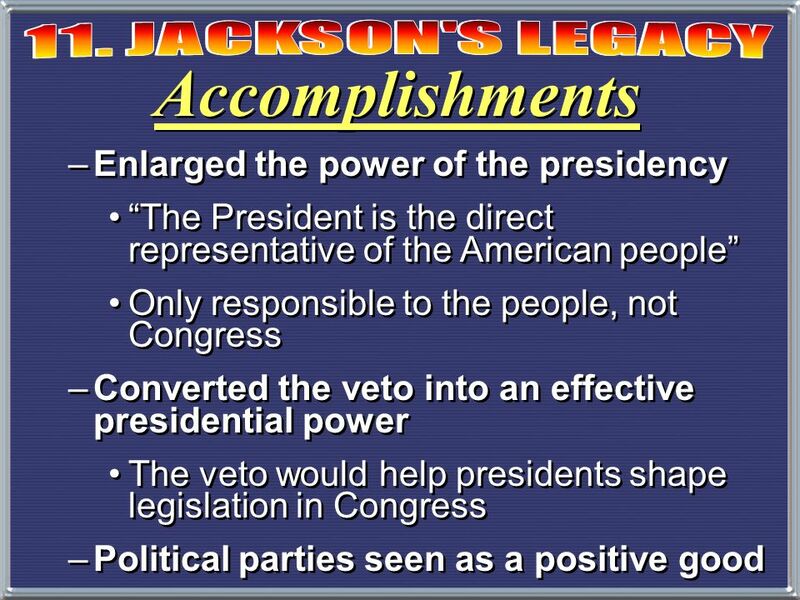 Learning Targets I Can…Identify and analyze sectional and national politics I Can…Identify ways in which Andrew Jackson increases the percentage of Americans.